Tropical Malaysia is blessed with warm weather all year round, so we don’t get to play around with the moods, colours, and nature’s bounty of the changing seasons. But we don’t let that get us down too much – with a bit of creativity, we can create our own anytime! Which brings us to Ivan and April’s big day. 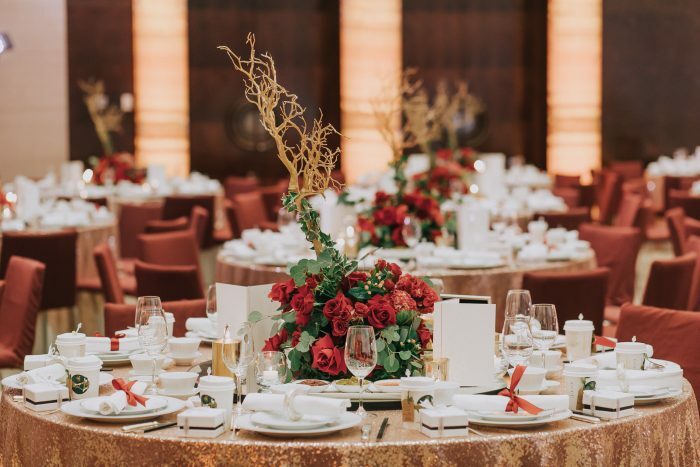 After discussing with their wedding planner Evelyn of Moments, our couple decided on a woody, autumnal palette with red, brown and green hues for their dinner reception. Let’s take a look at the beautiful details captured by Louis Loo Photography. Backdrop for the morning’s tea ceremony. 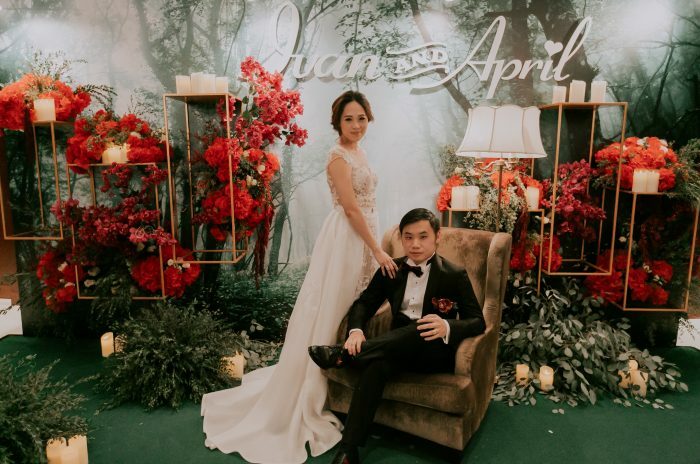 Congrats dear Ivan and April! Our bride’s bouquet is a little taste of what’s to come. April came to know of us via Instagram, weddings of friends, and word of mouth.. and the rest is history. Thank you Ivan and April for entrusting us with your most treasured day! 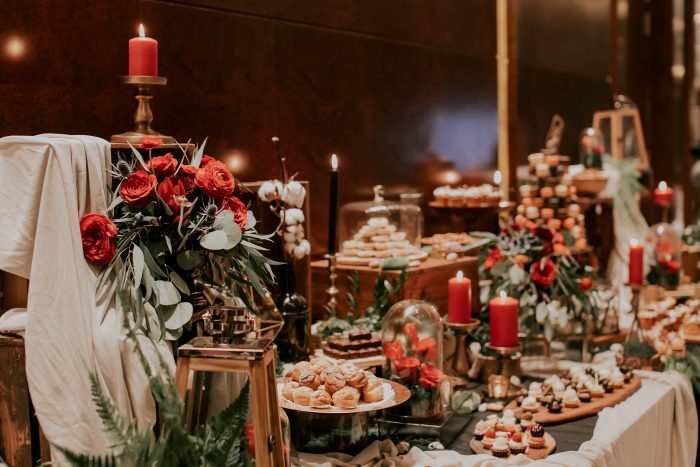 At the evening reception held at Grand Hyatt Kuala Lumpur, our couple prepared a little dessert bar for their guests to enjoy before dinner. 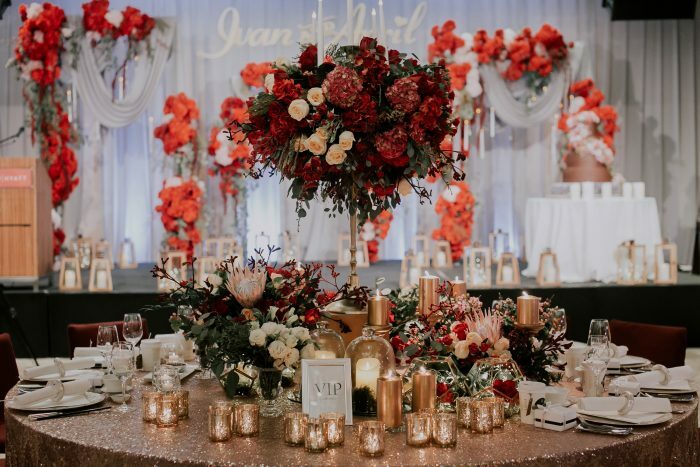 We love how gorgeous the colours and elements came together and created a warm, rustic enchanted forest atmosphere that is incredibly elegant and inviting. 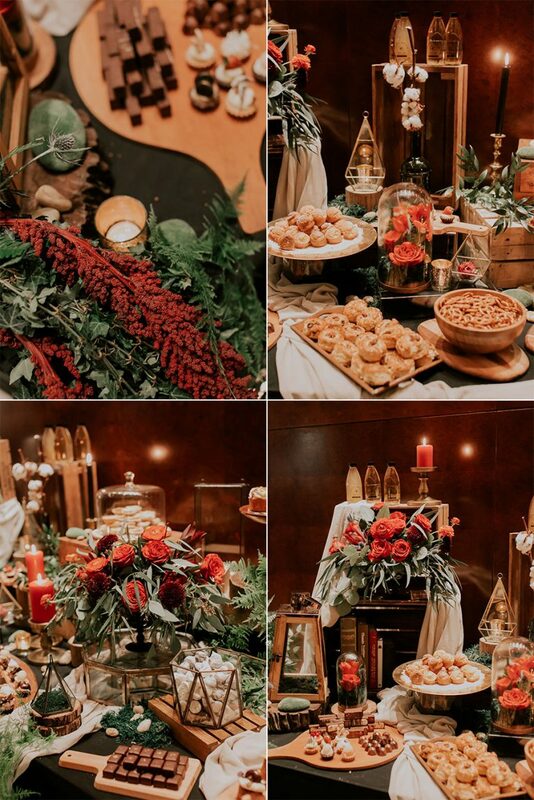 With some red flowers, red candles, bronze-coloured accessories, and lots of greenery, the dessert bar was as pretty as it was delicious. The dessert bar is feast for the senses. We love the mix of elements such as wood, stone, glass, metals, together with different shapes, textures, and heights. They add so much aesthetic and visual appeal to the autumnal atmosphere we wanted to create. 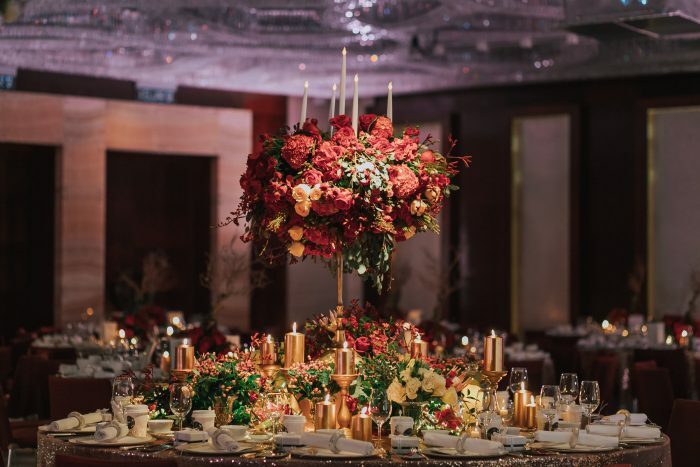 Deep red, green, and gold hues provide a crowning glory for the bridal table. 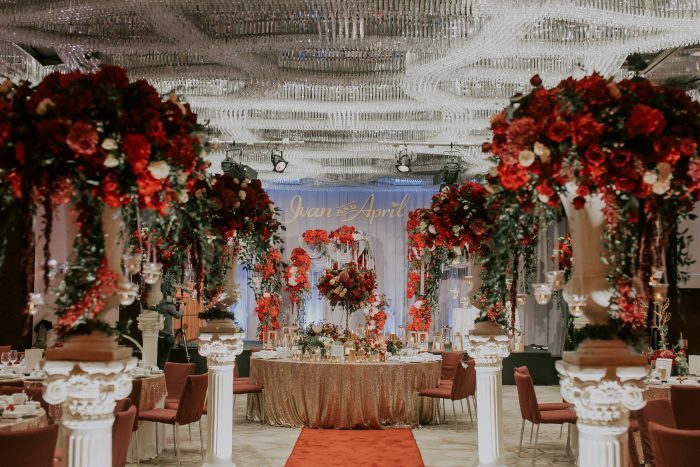 The aisle, leading to the bridal table and stage. 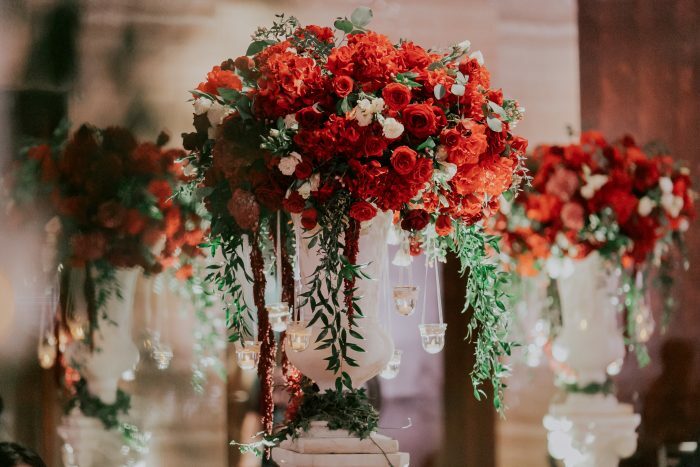 Close up of the aisle flowers. 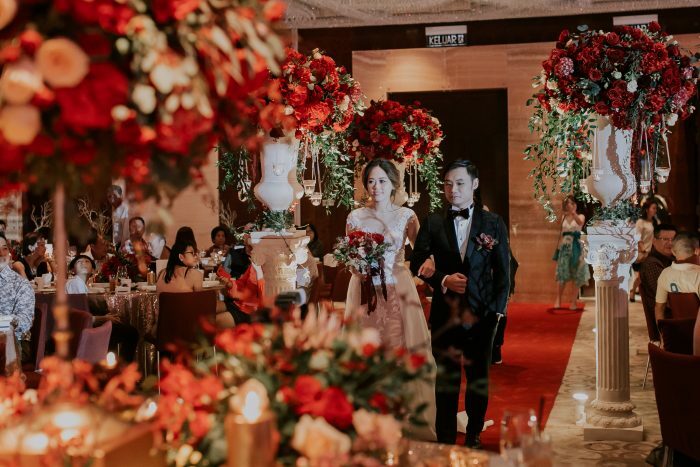 Our newlyweds make their way into the ballroom. Another view of the bridal table and centrepiece. Lots of beautiful details in gold, red, and green. Centrepieces for guest tables with a little structural flair. 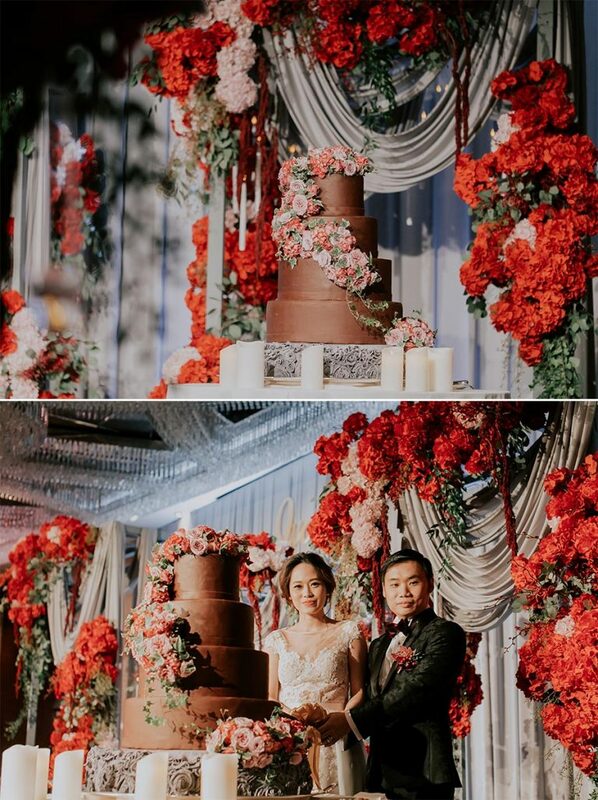 A gorgeous backdrop for an equally beautiful wedding cake – decorated by the talented chefs at Grand Hyatt Kuala Lumpur. Our couple was inspired by a wedding cake design they saw online, and decided they liked a “darker cake” adorned with flowers to complement the rest of their wedding decor, instead of going with a more traditional white cake. 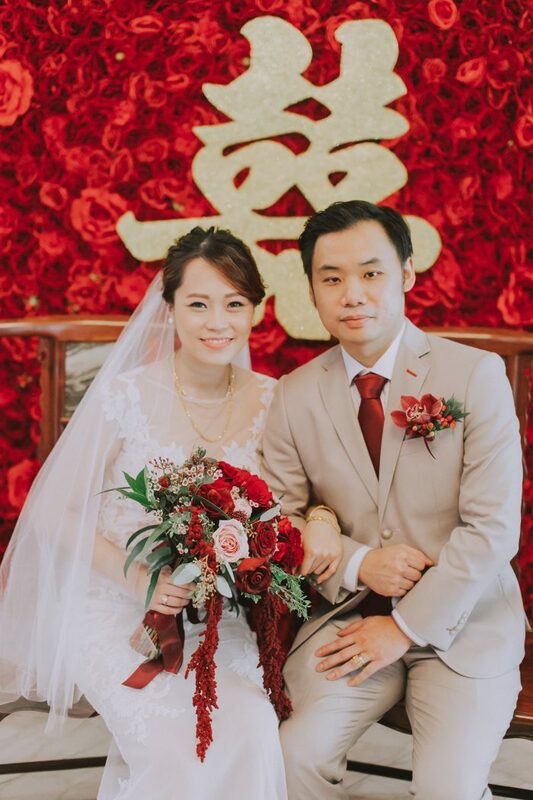 Yum seng to a long and happy marriage! Ivan and April take a minute in the photo area set up outside the ballroom. 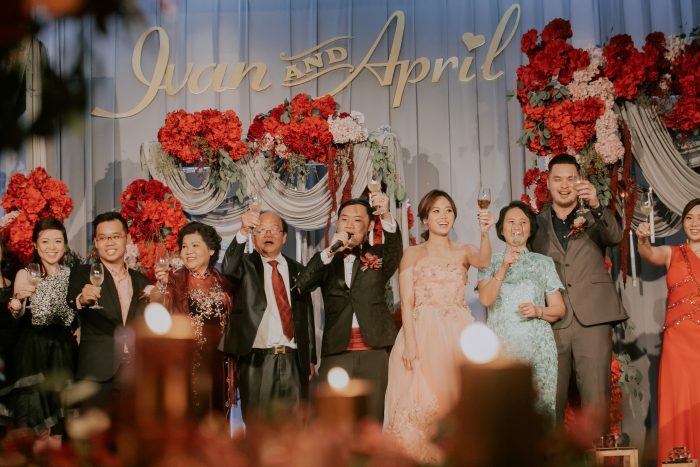 We’re so happy to have been a part of your wedding day, dear Ivan and April. Thank you for sharing it with us, and also with our wonderful readers on the blog! We wish you both the very best in your new life journey together. 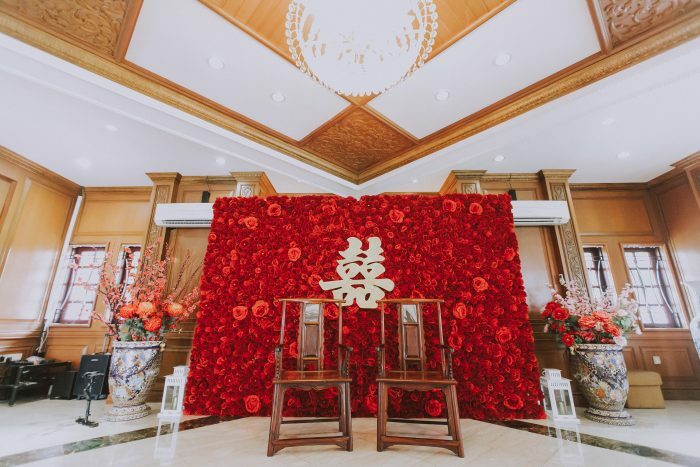 “We thought the dessert bar was a beautiful sight to the eyes (although sadly we didn’t had a chance to savour any of the food) , and the photo booth done up by Wishing Tree was exactly like how it was sketched. Absolutely loved our main table with the cascading flowers and the candles, all nicely arranged just as the way we liked it.